Sat here this morning trying to figure out what song I would play for this Sunday and found myself going down a deep rabbit hole on YouTube, bouncing from genre to genre with songs that dealt with the weather, given the focus in recent times with Hurricanes Harvey and Irma and little brother Jose, tagging along for the ride. There was Stormy Monday, Gloomy Monday, Stormy Weather, Blowin’ in the Wind, Couldn’t Stand the Weather, Who’ll Stop the Rain, Have You Ever Seen the Rain and on and on. It was dizzying, so much that it made me shuck the whole idea of weather when I was listening to Like a Hurricane from Neil Young. The version was from his 1979 Live Rust album, one that I love but haven’t heard in some time. Just hearing that song made me want to hear his Hey Hey, My My which has the line: rust never sleeps. There’s just something about that simple line. 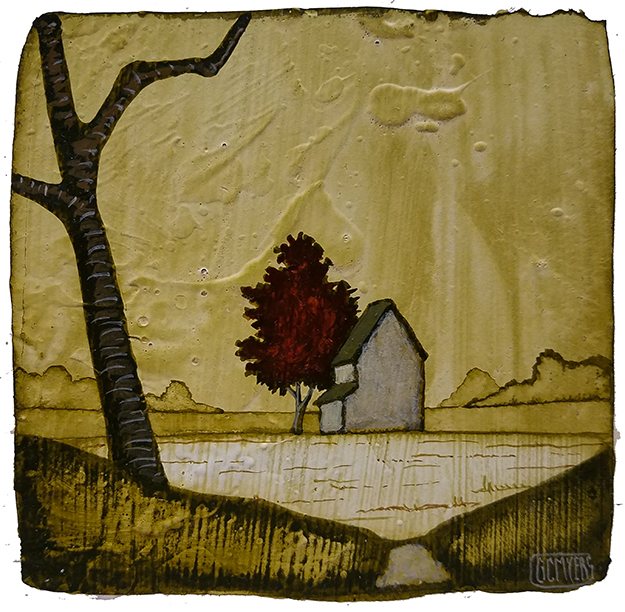 I thought it fit well with this new smaller painting shown here, enough that I am now calling it Rust Never Sleeps. Headed with me to the Principle Gallery for next Saturday’s Gallery Talk, it reminds me of an old photo that is always aging, losing its color as it fades away, the subtle tones turning to a sepia-like color. Tucked away in some place out of sight, it is always breaking down and only comes to life when you come across it at some distant point in the future. And even then it may only be as faded a memory as the photo itself. I’m playing both versions of Hey Hey, My My from the Live Rust LP. The first is the straighter version, closer to the original released song with an acoustic guitar. The second is the heavier electric version. God, I forgot how much I liked this song! Weather aside, try to have a good Sunday. Gary – I love that voice. Thank you for sharing. I liked the first version best.